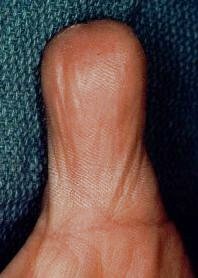 This patient had a thumb tip avulsive amputation treated elsewhere with a V-Y advancement flap. There was inadequate soft tissue cover, terminal digital neuromas, poor vascularity of the tip, constant aching pain and persistent tenderness. 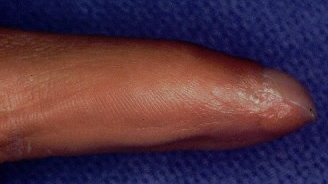 Out of the variety of treatment options, including another try to add more skin to the tip with a flap, the patient chose amputation revision. Nail visible from the palm. The previous flap did not provide enough padding for the tip. 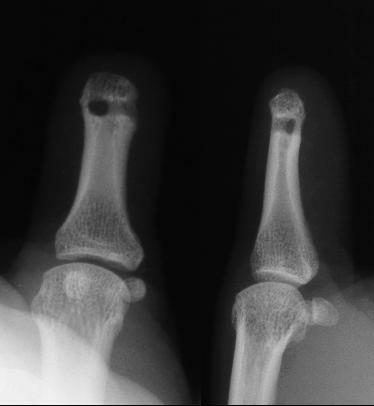 Bone tip just beneath the skin, line on the film traces the thumbnail edge. In the amputation revision as a DIP disarticulation, the palmar digital nerves are buried in drill holes the head of the proximal phalanx to avoid sensitive neuroma symptoms. Final result, actually very gratifying. Pain free for the fist time since the injury, now able to loudly snap thumb and index finger. Drill holes in the bone with protected intraosseous neuroma.